Of all the misfortunes that can befall us in our everyday lives, few come with the same blend of horror and indignity as staring down into a toilet that refuses to flush. As the water level in the bowl rises ominously, we plead, we pray, we hope against hope that the problem will somehow miraculously resolve itself and we will be spared the mortification (and mess) of a spillover. And when you’re a guest in someone else’s house, you plead and pray at least 10,000 times harder. The only consolation in this dreaded scenario is that it happens to all of us. And, in the end, it might make for a good story for your closest friends to enjoy. But take heart, there are some simple solutions for this always-untimely event. The following are 5 time-tested tricks that have worked wonders for many a poor soul, listed here from the easiest to the hardest. Toilets, like all plumbing drains, work by the force of gravity. A full bowl of water exerts its own pressure on the clog and, over time, often will clear the clog for you. So if you have more than one bathroom in the house, just wait it out overnight, or as long as you can. Then, try to flush again. If it’s a standard clog (too much paper, in most cases), this passive solution is surprisingly effective. Warning: When you do the test flush after the waiting period, be ready to stop the water flow to the bowl (see Top Toilet Tip, below), just in case this method didn’t work. If you don’t have the time to wait out the clog, or if you’d like to increase your chance of success by giving gravity a helping hand, you can pour a few cups of hot water into the bowl. Proponents of this technique believe that the hot water helps to break down the waste, thereby loosening the clog. Can’t hurt to try. However, this doesn’t mean you should be pouring pots full of boiling water into a cold, brittle, china toilet bowl, which could crack it. This is clearly the preferred method when you’re not at home and would do anything to avoid having to break the news to your hosts. A few good squirts of liquid dish detergent is perhaps the most popular method, but again, if you’re a guest and not alone in the house, it can be hard to explain why you have a sudden need for Palmolive in the bathroom before you’re ready to join the party again. Other lucky souls have reported that liquid hand soap or shampoo have done the trick nicely, too. The theory here is that the soap breaks down the waste faster than water alone. When it’s time to flush, be ready to stop the water to prevent spillover. 4. Plunge like a pro. First of all, standard cup-type plungers don’t work well on toilets because they can’t provide a good seal over the drain hole. Instead, use a flange plunger, which has a rubber sleeve that extends down below the domed cup, or boot, section. Flange plungers with accordion-like boots work well, too. Make sure the flange is extended (it can fold up into the boot), then lower the plunger into the toilet at an angle so the boot fills with water and isn’t trapping air. Insert the flange into the drain hole and press down so the boot seals tightly around the hole. Make the plunge action count on both the downstroke and upstroke, since both forces will help loosen the clog, and maintain a good seal at all times. If you have no success after several tries, let the clog sit and try again. Still no luck? Time for an auger. 5. Use a closet auger. A closet auger, or toilet auger, works just like a standard drain snake but is specially designed to accommodate the sharp turns of a toilet trap without damaging the bowl (which standard snakes can do). Work the business end of the auger into the drain hole, with the bend in the handle pole pointed toward the drain route. Crank the tool’s handle clockwise and work it in and out a little to break up the clog. If a solid object, such as a sponge or rag, is creating the clog, crank the auger clockwise to snag the obstruction, then pull it out of the toilet. Instead of standing by feeling helpless as a clogged toilet threatens to overflow, take action: Quickly remove the tank lid, reach into the tank and close the flapper—the round, rubber trap door that seals over the big hole in the bottom center of the tank. This will stop the flow of water into the bowl. Alternatively, you can close the shut-off valve to the water supply line. It’s on the wall behind the toilet, near the handle side and several inches above the floor. It has a football-shaped handle that you want to turn to the right, just like a faucet. Be warned, however: Old valves can be stuck and corroded, and turning them may cause some leakage. 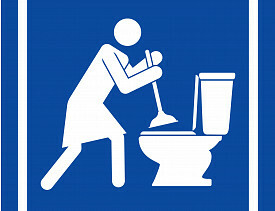 For reliable help with a toilet clog, hire a licensed plumber.